ERYCA was born on August 11, 1981 in Oshu City, Iwate, Japan. She started playing the piano when she was 3 years old and stared playing the saxophone when she was 10 years old. 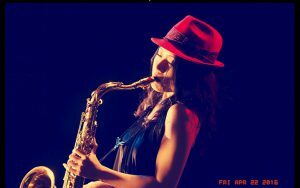 When she was in a high school, she started her career of a professional saxophone player. After she graduated from a high school, she entered VANTAN Art Academy in Tokyo and played for many concerts and recordings of various bands. She returned to her hometown, Iwate in 2004. Her concert in Los Angeles in 2005 was a great success. She also works as a radio personality in a community radio broadcast station, Oshu FM, and she has been acting as a main personality of the radio program “SUN DELICA” since 2007. She played with Shuichi “PONTA” Murakami, the best drummer in Japan, for the first time in August 2009. Then they started “ERYCA BAND”. They formed another band named “Sylf” later and toured all over Japan. She is also showing her various abilities as a newspaper columnist and a fashion model.